Aberdeenshire’s most senior fire officer is asking the public to help ensure our towns and villages safe as safe as possible from preventable fires this Spring season. As we move towards the Spring and into the Easter holidays, Scottish Fire and Rescue Service’s Local Senior Officer for Aberdeenshire and Moray, David Rout, is urging the public to do what they can to prevent fire. In March and April 2014 there were 2,384 deliberate fires across Scotland and while the totals are down significantly from a high of 4,677 in March and April of 2011, it shows that although SFRS is making a considerable impact there is still much work to be done to reduce the number of fires further. 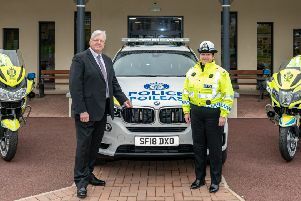 The service will work together with partner agencies such as Police Scotland, Scottish Environment Protection Agency, Aberdeenshire Council and Crimestoppers Scotland to prevent fires and the police in highlighting the need to report fire offending. LSO Rout, said: “We want to ensure the Easter break period is an enjoyable one for everyone, but it’s equally importantly that people remain safe from fire. He added: “We would urge parents to ensure that their children know about and understand the potentially tragic consequences deliberate fires can have, as well as the impact for responding emergency services. “Our crews work hard to provide education and advice about the risks and also respond when fires do break out. “The public can help them to keep people safe by heeding our safety advice and sharing it with others. “Many fires, including rubbish, refuse, grass, fly­tipping and wildfires in the countryside are started deliberately or are due to careless, reckless or irresponsible behaviour. Chairman of Aberdeenshire Council’s infrastructure services committee, Peter Argyle, said: “While it seems incredible that anyone would deliberately set a fire without legitimate reason, it does happen in towns and in rural locations, having potentially very serious impacts on communities’ safety and wellbeing. “Fly tipping, a highly antisocial and illegal activity in itself, can also be a fire hazard and I urge anyone looking to dispose of waste to take it to an appropriate council facility instead. “I’d urge the public to report large amounts of waste at www.dumbdumpers.org or call the stop line on 08452 30 40 90. “Our co-­ordinated multi­agency approach will help to ensure that we keep the public safe as we enter the Spring season.